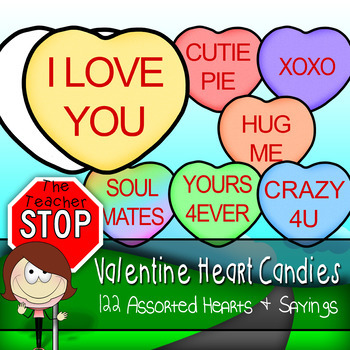 These fun candy hearts are full of color and witty charm for anyone's Valentine's Day!! There are 20 unique sayings for 6 different colors, equaling 120 hearts!! 1 blank b&w heart and 1 special rainbow "soul mates" heart included. This product is a .zip file. Each heart is 6" in size and is saved in 300 dpi in PNG format with a transparent background so that it can be layered and easily positioned. The Teacher Stop is owned by Chris Williams and Leanne Baur.